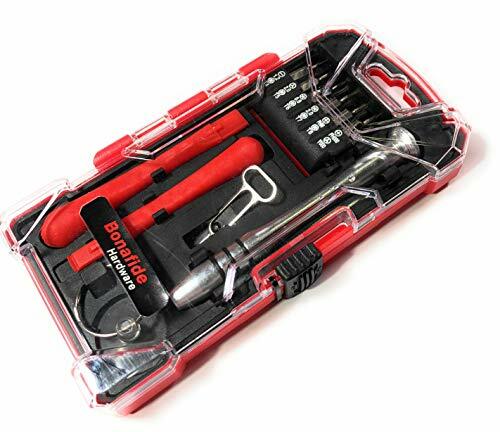 This Bonafide Hardware multi-function kit comes with 12 different magnetized bits and 5 other tools to help make your repair efficient yet portable at the same time. With the wide range of electronics this small tool kit will make the perfect gift for anyone that enjoys technology and is also prone to accidents. When life happens it is great to always be prepared. 100% Customer Satisfaction Guaranteed. If for any reason you are not happy with our product we will do our best to make it right! 12 Bits: All different sizes, but they are all magnetized making repair easy and painless. 1 Suction Cup: Helps get the screen off without any problems. 1 Aluminum Driver: The driver is also magnetized making the connection between the driver and the bits simple. The driver has three anti-slip strips on it making it easy to hold. The end also rotates in the palm of your hand when you're twisting off the screws making it even easier to repair your electronics. 2 Plastic Pry Tools: They are both different sizes making it easy for you to make scratch free repairs on items varying in size. 1 Sim Card Removal Tool: Helps you easily remove the Sim card from your phone without damaging the device. Durable and Convenient: The driver and the bits are metal so they will last you through many repairs. The labeled compartments makes storage easy. All the components have secure fastings to keep them from getting thrown around during transportation to prevent damage. Easily Accessible: Since this tool kit is magnetized it makes the process of fixing things easy and fast! This tool kit is also simple to use because all of the bits are labeled clearly to help you know which bit you need. Variety: With the Bonafide Hardware 17 piece tool kit you get the following bits: PH00, PH000, Y000 Flat 1.2, Pentalobe 0.8, 2.0; Torx 4, 5, 6, 7, 8, and Triangle 2.0. The Y000 fits the new iphones. The variety of bits makes it so that you can use these to fix a Cell Phone, iPhone, Android, iPad, Watch, Nintendo Switch, Tablet,MacBook, PC and More. Portable: The size of this tool kit makes it easy for you to have it in your backpack or car, and have it readily accessible whenever you need to do a quick repair. Warranty: If you are not 100% satisfied with the product let us know and we will help you in any way we can. If you have any questions about this product by Bonafide Hardware, contact us by completing and submitting the form below. If you are looking for a specif part number, please include it with your message.